Farmers and producers can gain a sharper edge and glean cutting-edge ideas from experts from the College of Food, Agricultural, and Environmental Sciences at The Ohio State University during this year’s Farm Science Review Sept. 22-24 at the Molly Caren Agricultural Center in London, Ohio. The Review will again emphasize the best agricultural research, resources, information and access for farmers, said Chuck Gamble, who manages the Review. Last year, the Review offered 180 educational presentations and opportunities presented by Ohio State University Extension educators, specialists and faculty, as well as Purdue University educators. Farm Science Review is all about learning new tips, techniques and information to help producers increase their farm operation’s bottom line, Gamble said. Following the theme, “Sharp Ideas, Sharp Equipment and Sharp Results,” some of the issues participants can expect to learn more about include the agriculture economy, grain markets, land values and cash rents, Gamble said. “Because we’ve had a good planting season so far, it will likely lead to lower prices – that’s the challenge growers are facing right now,” he said. “Lower grain prices are causing farmers to seek ways to lower costs, improve efficiencies and to improve marketing. The Review will also offer information on water quality and how producers and growers can comply with new Ohio laws in that area, Gamble said. These issues are just a sampling of the topics participants can expect to learn about during the three-day farm trade show that annually draws more than 130,000 farmers, growers, producers and agricultural enthusiasts from across the U.S. and Canada. The Review, now in its 53rd year, is nationally known as Ohio’s premier agricultural event, Gamble said. Sponsored by CFAES, the Review features educational workshops, presentations, demonstrations and educational opportunities delivered by experts from OSU Extension and the Ohio Agricultural Research and Development Center, which are the outreach and research arms, respectively, of the college. Participants can peruse 4,000 product lines from 620 commercial exhibitors and capitalize on educational opportunities from Ohio State and Purdue specialists. Plot demonstrations by members of the OSU Extension Agronomic Crops Team on corn, soybean, cover crops and bio-energy crops in plots established at the eastern edge of the Review exhibit area. The plots are just outside Gate C near the main entrance gate. A comprehensive demonstration of an unmanned aerial system for real-time crop surveillance. Used as another tool in the farmer’s precision agriculture toolbox, the drones can be used to provide useful local site-specific data including crop scouting and geo-referencing. This allows growers to monitor pesticides dispersion and fertilizer usage and to monitor crop health parameters including soil moisture. “This year will be the most concerted effort we’ve had in terms of offering information on drones, as they are even more important for farmers now,” Gamble said. 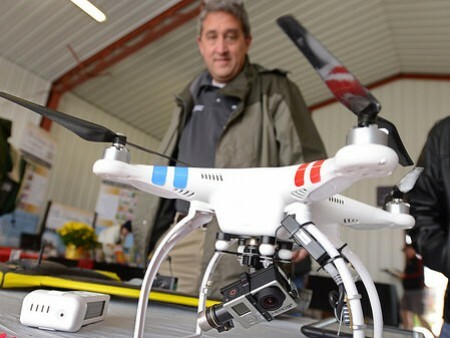 “The Ohio-Indiana UAS Complex and Test Center is assisting with obtaining the Certificates of Authorization (COA) to fly drones for the demonstrations. Advance tickets for the Farm Science Review tickets are $7 at all OSU Extension county offices, many local agribusinesses and online starting in July at fsr.osu.edu/visitors/tickets. Tickets are $10 at the gate. Children 5 and younger are admitted free. Hours are 8 a.m. to 5 p.m. Sept. 22-23 and 8 a.m. to 4 p.m. Sept. 24.